In Krakatoa: The Day the World Exploded, Simon Winchester's book based upon eyewitness accounts, we learn about the final minutes leading up to Krakatoa's fourth explosion. Johanna Beijerinck heard the frightful sound of the fourth explosion, too. She - like many others - temporarily lost her hearing (as dramatized in this video clip). Then came sudden, terrifying stillness. When I had walked about 15 paces, still in my doubled-up position, I stubbed my toe on something very peculiar. I ran up against large and small branches and did not even think of avoiding them. I entangled myself more and more in that nightmare of branches, all entirely stripped of leaves. My hair [it was knee-length] got caught up, and each time with a twist of the head I managed to free myself. Then something got hooked into my finger and hurt. I noticed for the first time that my skin was hanging off everywhere, thick and moist from the ash stuck to it. Thinking it must be dirty, I wanted to pull bits of skin off, but that was still more painful. My tired brain could not make out what it was. I did not know I had been burned. Worn out, I leaned against a tree. According to the long account which Johanna wrote about the ordeal, for a time she could hear nothing. It was the sound of the volcano, destroying itself, which caused her temporary loss of hearing. She didn't 't know that, however, and believed she must have been dead. Then ... something happened which made her realize maybe she was still alive, after all. Was it imagination or did I hear something after all? I listened and heard, first dampened and then more clearly, someone shouting and screaming for me. Everything was once more clear in my mind. I recognized my husband’s voice calling me and shouting. Why was I dead and the rest of them still alive? She was still alive. Many people around her were not. We can find a listing of places where the sounds of the exploding volcano were heard. (See Table IX, page 80, of The Eruption of Krakatoa and Subsequent Phenomena, by the Krakatoa Committee of the Royal Society, published in 1888.) Rodriquez Island, in the Indian Ocean, was the farthest from Krakatoa - 2,968 "English miles" (see page 87) - where people heard Krakatoa's explosions. "Several times during the night of the 26th-27th reports were heard coming from the eastward, like the distant roars of heavy guns. 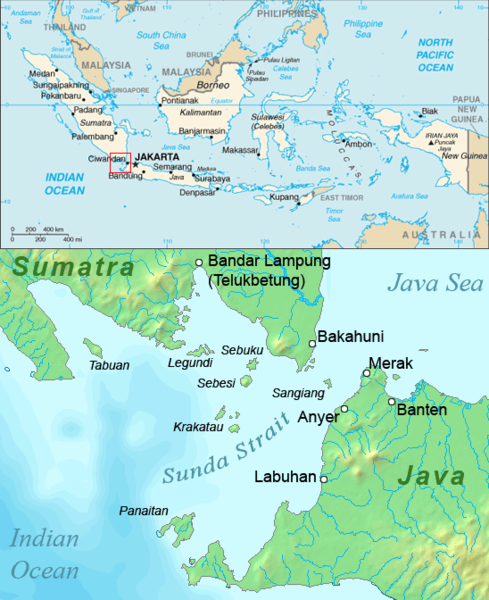 These reports continued at intervals of between three and four hours, until 3 p.m. on the 27th (=5:48 p.m. local time at Krakatoa), and the last two were heard in the direction of Oyster Bay and Port Mathurie." Report by Mr. James Wallis, Chief of Police. Excerpts from Johanna Beyerinck's 19th-century account, quoted by Rupert Furneaux in Krakatoa, published in 1964, at page 107. Online, courtesy Google Books. Bos, Carole "Krakatoa - Loudest Sound in Recorded History" AwesomeStories.com. Oct 07, 2013. Apr 24, 2019.